All Are Precious In His Sight: Selah's Having Surgery Wednesday at 11AM! Praise God, I got to speak with Dr. George this evening!!! He will be doing Selah's shunt replacement tomorrow, Wednesday, March 23, at 11AM. He felt that the remaining hematoma (collection of blood between the brain and skull) is small enough that it should reabsorb into the brain and drain itself. There doesn't appear to be any new bleeding, according to the MRI, so Dr. George believes he'll be able to focus solely on shunt replacement in this surgery. Selah's ventricles appear to be of normal size now, so he feels her brain is ready for the shunt replacement. Dr. George will completely remove the old shunt, which might be tricky because it's intertwined in places of the brain where it shouldn't be, but I'm praying our Jehovah Rapha will guide his hands and prepare the path for success for Dr. George. Once the old shunt and tubing is removed, Dr. George will place a new programmable shunt into one of Selah's ventricles and run the drainage tube down into Selah's abdomen, where it was before, so that it will drain excess fluid into her tummy, where it will be reabsorbed into her body regularly. The programmable shunt will allow him to fine-tune the settings so that Selah's brain isn't over drained or under drained. Praise Him for this technology and for allowing Dr. George to do this surgery. Selah didn't sleep well last night either (2nd night in a row of very little sleep), but she had a GREAT day today! My sister came to stay with Selah for a few hours while I went to the Ronald McDonald House to do a little laundry. Then I took a long walk over to a shopping center a few blocks down from the hospital. Shortly after I had entered the first store, my sister called to tell me that Dr. George had stopped by the room to visit with me. AGGGHHHHHH!!! I rarely leave Selah, and the doctor I've been longing to visit with just happened to stop by while I was GONE! My sister asked him to come back, and he said he would, so I abandoned my shopping cart and sprinted back (in flip-flops) to the hospital. I got back around 1:15PM (I think) only to find that Dr. George didn't make it back by here until around 6PM. But that's OK, at least I got to talk to him!!! My sister brought a portable DVD player to put in Selah's bed to see if it would help occupy her during the times that she's awake. (I had downloaded some Baby Einstein apps onto my iPhone, which Selah LOVED, but I had to stand cribside and hold the phone for hours while Selah soaked in the genius teachings!) So, this afternoon, I plugged in the DVD player and Selah excitedly watched an Elmo DVD over and over and over again!!! Who would have ever thought that I'd be excited about my 5-month-old watching DVD's?!?! Well, let me tell you, after spending 9 days of standing next to Selah's hospital crib for 14+ hours/day, trying to entertain an active baby while keeping her on her back, not rolling over, holding her head still, without picking her up, well, let's just say the DVD system was a godsend!!!!!! I got to sit down for 3 hours today, and I was SOOOOOOOOO excited!!!!!! I had to fight to stay awake during my 3 hour sitting spell because I didn't want to miss Dr. George, but it was heavenly to sit down and rest my throbbing feet. I fell apart last night and sobbed at 12:15AM. I had worked and worked and worked to try to get Selah to sleep, and finally at midnight, she was out. Then a nurse came in at 12:15AM to start some IV fluids, which woke Selah, and then she didn't go back to sleep. I was SO exhausted from not sleeping the night before that I fell apart. It felt good to sob though, and shortly thereafter, I started bossing my heart and asking God to sync it with His. The blessings were abundantly popping into my mind, so I asked God to help me praise Him in this storm instead of pitying my lack of sleep. Here are just a few of the blessings that I am praising God for: Selah is alive and thriving. I am able to stay by her side 24/7. I have an awesome husband who works hard so that I can stay home with my children and be by my children's side any time they are in the hospital. All of my other kiddos at home are amazing, they're holding up well without Mommy being home, plus they're doing a a FANTABULOUS job of keeping up with their chores, serving joyfully, and taking care of one another in a way that Jesus would be proud. My friend and our school teacher, Stephanie, is going above and beyond to serve and help our family in ways that I'm not even fully aware of, such as driving our kids to various appointments and activities. Stephanie's daughters, Samantha and Emily, were home for Spring Break and helped tremendously with our kiddos and the ranch. 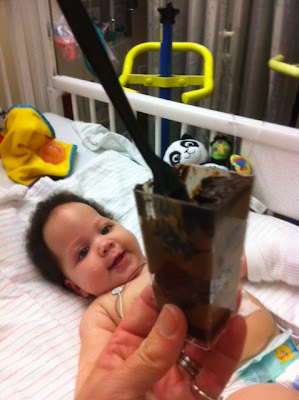 Our family, friends and even strangers bring yummies/gifts to the hospital for us and constantly ask how they can help. Friends have showered blessings upon our family by delivering dinners to our home every single night since Selah has been in the hospital. My in-laws have picked up and delivered our Sam's Click-n-Pull order of the week...twice. People around the world are praying for Selah and our family. 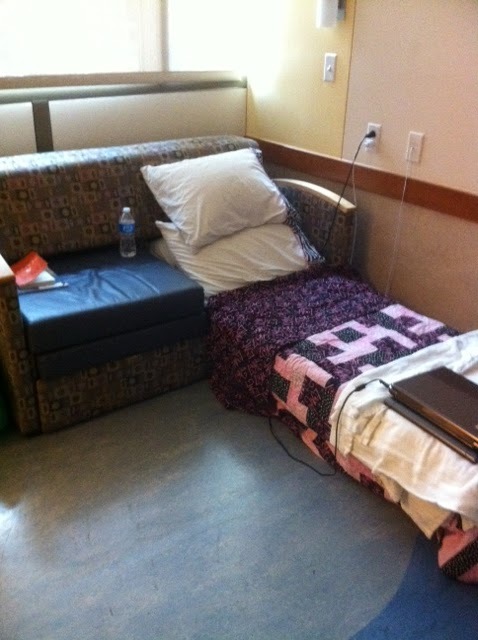 We have a large private hospital room. I have an almost real bed (instead of a chair) to sleep in (a pull out couch cushion). I have my pillows from home and my daughter's quilt to sleep with. My hubby brought our large HEPA filter to the hospital room, which helps drown out the myriad of noises, door slams, voices, alarms, beeping, intercoms, announcements, etc. I have a private full bath right here in the room. The hospital and staff are wonderful, always asking if they can get us anything. The hospital grounds are beautiful. The cafeteria delivers meals to the room, and the food is pretty good. The Ronald McDonald House has free laundry facilities. I have more chocolate than I can consume! I am healthy and well, as are my husband and children. Selah is a delight, a blessing of the Lord, and I'm honored to have been chosen to be her mom, and I wouldn't choose to be anywhere else but by her side as long as she's in the hospital. The list of blessings is infinitely long, but I'm exhausted, so I need to stop the list and get ready for bed now. Selah won't be able to have any formula after midnight, so please pray that she has a good night with peaceful sleep. It'll be a challenge to keep her happy in the morning without being able to rock and bounce her, so extra prayers in that department would be greatly appreciated. And, of course, HUGE prayers for Selah's brain surgery!!! Oh how delightful it would be if there were no complications and we were able to go home Friday!!! (Dr. George said we should be able to go home Friday if there aren't any issues!!!) PTL! Just praying Selah does well and recovers quickly and fully, without complications. My friend Lisa brought this chocolate "shot" from La Madeleine's bakery. Even Selah was excited about it!! !